High Density Ceramic Polishing Media is a heavier, longer lasting media ideal for use when reduced cycle times and low residue processes are required. Both deburring and polishing formulations are available in a variety of sizes and shapes. High Density Ceramic Tumbling Media is a heavier, longer lasting media ideal for use when reduced cycle times and low residue processes are required. High Density Ceramic Tumbling Media will provide quicker deburring and higher polishing in all types of tumbling equipment. The range of Liquid Finishing Compounds for mass finishing are used in all types of tumbling. All are pH balanced and concentrated for optimal performance. Safe to use with all tumbling media types. The EV Series is engineered for production environments and heavy usage. Multiple sizes are available with customizable sizes commonly manufactured. 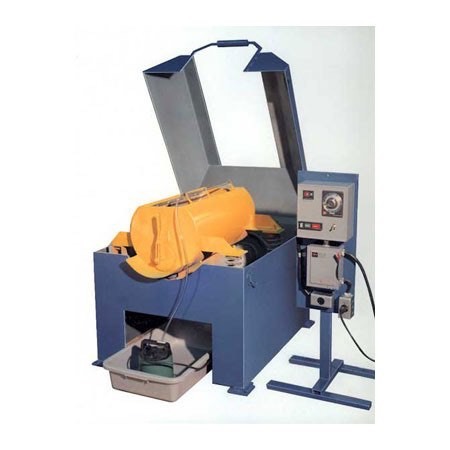 One of the most heavy duty vibratory systems available. Premium Ceramic Tumbling Media is designed for specific applications where precision deburring and polishing is required. The smaller sizes are ideal for intricate finishing jobs. Perfect for deburring and polishing in tight areas and smaller parts. Ceramic Tumbling Media is ideal as a general-purpose media and can be used with almost any type of material and part shape. It is best for harder metals and plastics and for more aggressive requirements. Ceramic Tumbling Media is available from polishing to ultra-aggressive bonds.